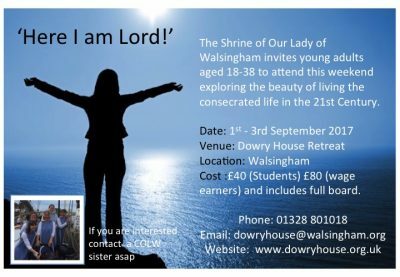 Venue: Dowry House Retreat, Walsingham, Norfolk. At the age of 17, the Servant of God Luisa Piccarreta wrote her first novena of preparation for Christmas with 9 hours of meditation. After finishing it, Our Lord invited her to meditate continuously on the last 24 hours that He suffered during the course of His Passion, beginning with the moment when He said good-bye to His Mother (that is, before instituting the Eucharist) and ending with the moment when Jesus was buried. Therefore, meditating on one Hours of the Passion means to be united to the prayers and reparations that Jesus offered interiorly to the Father while He was being scourging, crowned with thorns, crucified, etc., and for this purpose, we follow the book, “The 24 Hours of the Passion of Our Lord Jesus Christ.” In such a way that every time we read, meditate, and penetrate into every hour of the Passion, we must try to make Jesus’ prayers, intentions and reparations our own so that together with Him we can offer them to the Father for the salvation of souls and the benefit of all humankind. After the Servant of God Luisa Piccarreta had been living continuously the Hours of the Passion for over thirty years, Saint Hannibal Maria Di Francia, who had been appointed as the Ecclesiastical Censor for all her writings, commanded her under Holy Obedience to put them into writing. As a result we have this Book of Heaven. Seeing the wealth of its content and glimpsing all the good that they would do to our souls, Saint Hannibal printed the first four editions of this book in the years 1915, 1916, 1917 and 1924. After the S.G. Luisa Piccarreta finished writing the original manuscript she sent it to St. Hannibal along with a letter. In this letter she speaks of the complacency that Jesus feels whenever we meditate on these Hours. She says, “as if Jesus heard His own voice and His prayers being reproduced in those reparations, just as the ones He raised to His Father during the 24 hours of His sorrowful Passion.” Also, Luisa included along with the manuscript and letter some additional notes in which she listed the effects and promises that Jesus makes to whoever meditates on these Hours of His Passion. The retreat is led by Sisters from the Community of Our Lady of Walsingham and, in addition to the basic costs, you will be invited to make an additional donation of £25 to cover their costs. Why Mary is full of joy? How we can enter into Mary’s Joy? How does Our Lady help us grow in Faith, Hope and Charity. Along with daily Mass and adoration, there will also be opportunities for confession and questions. Retreatants are invited to arrive on the Thursday evening and spend the Friday in silence meditating over some scripture passages which will fall the backdrop to the retreat. The retreat itself will start on Friday evening at 9pm with the arrival of Fr Dominique and end on Sunday afternoon by 5pm. Fr Dominique Faure is an inspiring Missionary Religious Priest with a deep philosophical, theological and contemplative formation. At the personal request of Mother Teresa he spends most of his time travelling the world preaching retreats for the Missionaries of Charity and many other lay, priestly and religious communities. Recently based in New Zealand, he is also Chaplain and Professor to the Catholic Discipleship College in Auckland. Suggested minimum contribution to cover accommodation, full board and retreat giver costs is £200 (£100 for 18-25yrs, students and unemployed). Day rate option of £20 covering lunch and dinner also offered. Possibility of partially attending the retreat although priority will be given to full-attendees. To book, please call 01328 801018 or email dowryhouse@walsingham.org.uk. or download this booking form: Sharing in Mary’s Joy and send it to Dowry House. This year we have been busy getting settled into our first convent so only now, to celebrate Our Blessed Lord’s birth do we have a newsletter ready – following on from that of last Easter. We invite you to subscribe to them here. We aim to keep everyone up to date with news from the community, about our mission at Dowry House and on the Dowry Tour as well as provide food for reflection. The hope is to produce one at Christmas, at Easter and then in August/September. As you read the newsletters you can join us in thanksgiving for all that the Father is giving us and in intercession for the needs of all those we serve, for those of the world and for those of our candidates and current members. The retreat will be at Dowry House in Walsingham and will include a pre-festive Christmas meal and the annual Advent Carol Service in the Chapel of Reconcilaition. Please book by emailing dowryhouse@walsingham.org.uk or calling the sisters on 01328 801018 to check availability. God blessed us with very mild weather on the 3rd October when we had our open day at the House of the Divine Will. This enabled our 130 plus guests to enjoy the grounds and cloister as well as visit the barn. It was good to meet many of the local people from the various churches and we look forward to developing our links with them over time. Quite a few also braved the journey from Walsingham, from London and various parts of Essex. See photos of the day on our facebook page here. Joanna Bogle also gifted us with a hand embroidered kneeler which she personally presented to us on the day itself. 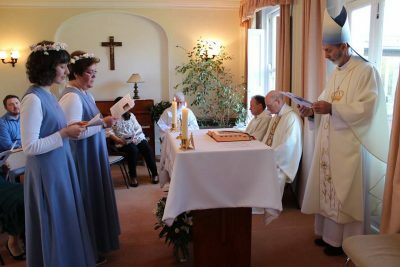 It was inaugurated by Sr Camilla, in the chapel overlooking the Moors, as she offered a prayer for all our guests and in thanksgiving for having reached this day. From 2pm until 5.30pm the stream of visitors touring the place and enjoying the scones and cream was constant and seemed unending. We could never have managed welcoming them all if it hadn’t been for the help of our great volunteers: Terry, Angie, Sarah, Sonia and Terri. So a BIG THANK YOU especially to them. By 6pm the flow of visitors had lessened and this made the viewing of the video clip on entering the chapel easier for everyone. ‘Your Will be done on earth as it is in heaven’. We see Walsingham Spirituality as being especially important for helping everyone learn to accept God’s Will, do God’s Will and gradually to surrender to God’s Will so as to live constantly in the Divine Will. This is the last of a series of retreats aimed at helping everyone enter deeply into this spirituality which is important for the return of our country to its Christian roots. During the weekend we will look in particular at the lessons received by Luisa Piccharetta from Our Blessed Lady of how to live in the Divine Will. This is what brings light and life to our souls and enables us to live in the joy Our Lady promised to all those who visit Walsingham. The Fiat is the source of true and lasting joy and will find its expression in a thanksgiving which will arise automatically in our hearts for all that God will send us. The third of a series of weekends to enable retreatants enter more deeply into the spirituality of Walsingham, learning in particular what it means to surrender to God’s Will in one’s life and live a spirituality of thanksgiving for all that God does for us. When we know we are loved by someone, deeply loved by them, we can trust their decisions regarding us, even if we don’t always understand their reasons. The same is the case in relation to God. The saying ‘Let go and let God’ is often quoted and yet so easy to accomplish. It is only when we stop relying on our need to control, to know, to be perfect, that we begin to taste the joy of allowing God to work freely in our hearts and lives. 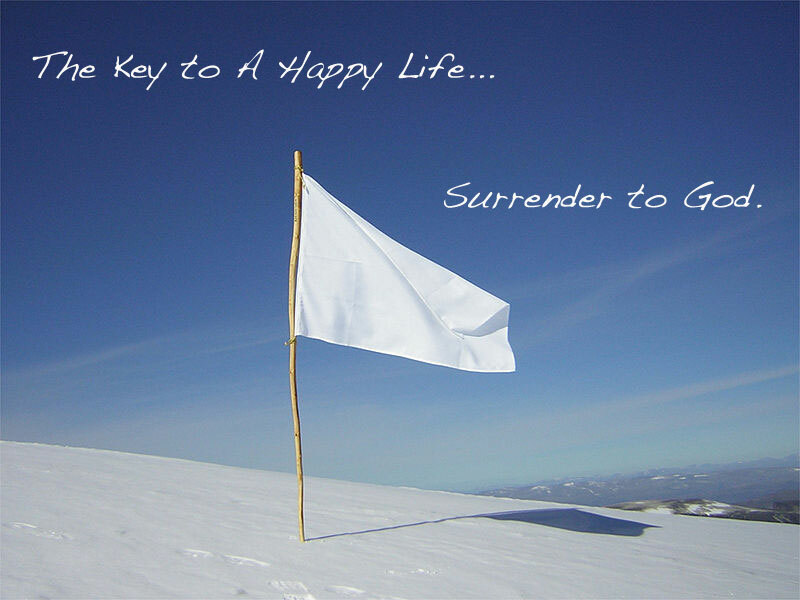 This weekend will provide practical anecdotes and tools to help grow in a life-giving spirit of surrender to God. When our hearts are empty of self and the above needs, like the Holy House of Walsingham, God’s Spirit can enter in and take us to places we could never even begin to imagine. In addition to the basic cost of board and lodging an extra minimum donation of £10 will be asked as a contribution to the work of the COLW Sisters who will be leading the retreat. On Saturday 7th April, at the midday Mass in the Chapel of Reconciliation, Sr Theresa made her final vows in COLW. 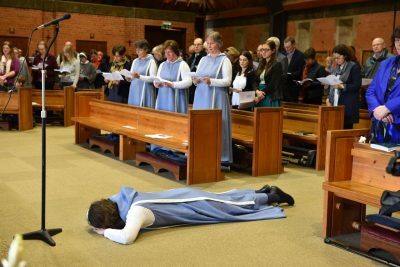 After eight years of formation she took this definitive step, consecrating herself to God’s service for the rest of her life. Surrounded by family and friends she looked radiant as she said her ‘YES’ to God’s love for her, a God who has chosen her to be all His – warts and all as we so often remind each other. On the vigil of the Feast of Divine Mercy we thank God for the gift that Sr Theresa is to us and to so many people. Now the real work starts! To watch the Mass again and hear Fr John’s superb homily visit the Shrine live stream page and go to the Mass of the 7th April. Please visit this link to see photos and share in the joy of the day. We thank God for all our family, friends, benefactors and supporters who made Sr Theresa’s final profession a day to remember. God bless you all! On the 8th December 2017, the Feast of the Immaculate Conception, after 8 months of fundraising and thanks to the generosity of many benefactors, we acquired our first convent. This amazing gift, rendered even more heartwarming by the kindness of the sellers (two brothers who built the property by converting old barns) couldn’t have come at a better time. With its simplicity and spaciousness, a central cloister area, eco-friendly wood chip boiler, a large outdoor barn and surrounded by 4 acres of land, it is perfectly monastic in style and miraculously suited to our needs. So much better than all the other properties visited it seemed to be made for us!. 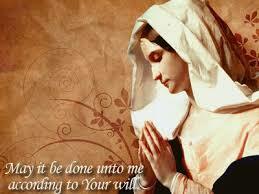 Please join us in thanking God for this amazing gift and Our Lady for obtaining it for us. For further information visit this page. This weekend is the second in a series of weekends designed to help people enter in depth into the Spirituality of Walsingham. Through a series of talks, lectio divina, silence, spiritual accompaniment and litugical prayer moments, the sisters will enable individuals to apply this rich spirituality in the reality of their own lives. Walsingham exists to remind us of the mystery of Mary’s silent surrender, her self-sacrificing love, her joy and humility in bearing and believing the Word of God. The Spirit is ultimate freedom, total unpredictability. God lives not in a ‘house made with hands’ but in hearts that are, with Mary, ready for anything – ‘Be it done unto me according to your word.’ At the heart of Walsingham lies the mystery of the Annunciation. The house symbolises stability. It was the house that made Nazareth permanently present in Walsingham, standing firm and strong, guaranteeing the future of the village and the Shrine. But this is balanced by the theme of the Annunciation which implies a radical openness to change and growth. Everyone of us carries within ourselves an element of unpredictability. Members of the Community of Our Lady of Walsingham will guide participants, through a series of talks and lectio divina, into what it means to imitate Mary’s FIAT, her YES to God’s love and will for her life. This second weekend will look especially at what it means to ACCEPT God’s will in the difficult times of one’s life and what it means to fulfil his will. At last we are all together at Walsingham. Having spent the last five years commuting to and fro from Brentwood to work at the shrine at Walsingham, we recognise the toll it has taken on us as individuals and as a community. With gratitude we recognise the gift that it has been to spend our first 13 years at Abbotswick – there couldn’t have been a better place for a founding group to c onsolidate and grow in self-undertsanidng of the charism given. As you all know, our spiritual home is in Walsingham and we are overjoyed to be now living and serving the shrine as a community – providing together hospitality and a sung liturgy to those using Dowry House Retreat (www.dowryhouse.org.uk) and partaking in the many events the expanding shrine is hosting. Being together as a community also means that we will be able to give more time to study, developing the charism and forming our lay associates now that we are on the road to becoming an Ecclesial Family of Consecrated life – open to people from every walk of life. We celebrated this milestone with a community day out in Norwich as you can see from the photos – one taken on top of the tower of St John the Baptist’s Catholic Cathedral, one whilst walking through the cloister of the amazing Anglican cathedral where we also attended evensong and one at the Julian shrine. What a welcome we have been given in all these holy sites! Join us for this first weekend in Walsingham, exploring the beauty of consecrated life in the 21st Century. There are many ways in which people can choose to consecrate their lives to God in the service of the Church and the World. This weekend will explore some of the general themes related to consecrated life and look at the various ways in which men and women can offer their lives in service of God, the Church and their neighbour e.g. apostolic religious life, enclosed contemplative life, ecclesial families of consecrated life, hermits and consecrated virginity to name a few. There will also be a Q&A panel on the Saturday afternoon …. so prepare already your questions for those who live the consecrated life in some of these forms. Time: Any time from 3pm on the Friday until the afternoon of the Sunday. If you cannot make the whole weekend how about meeting up with us on the Saturday at Walsingham? Please call us for any clarification needed. What to bring: Personal items, writing materials, Bible, walking shoes/boots. For further information call or phone Sr Carina on 01328 801013. Please can you help us to purchase our very own house in Walsingham? On a gloriously sunny spring day, Carina and Johanna make their first profession of vows in the community. In the presence of Bishop Alan Williams SM they promised to live chaste, poor and obedient for one year during the midday Mass on the solemnity of the Annunciation. The second reading at Mass was particularly apt: ‘We know that by turning everything to their good, God co-operates with all those who love him, with all those he has called according to his purpose. They are the ones he chose specially long ago and intended to become true images of his Son’ (Rom 8:28). We have known Johanna for a long time and, unexpectedly, she has been brought back to the UK and to COLW. What an immense grace for the community. Pope Francis always talks of being open to God’s surprises for as He declares through the prophet Isaiah ‘my thoughts are not your thoughts, neither are your ways my ways’. Please join us in thanking God for this wonderful gift and please keep Johanna especially in prayer at this time. If you are inspired by her example of generosity in giving her life to God and the service of His Church, please consider joining us for our next taster ‘Walsingham Spirituality Weekend‘. We were immensely blessed to have Sr Hettie Berflow, a Carmelite sister from the O Carms in the Netherlands with us from the 14th – 24th May. She led the annual retreat for our sisters in formation, taken them into the depths of the Rule of St Albert. Her gentle way of being, her pondered considerations and sharing, her wise accompaniment meant that we were able to appreciate so much more the gift given us in this rule, the basis of all Carmelite life. Albert, patriarch of Jerusalem, gave the first hermits on Mt Carmel a life rule (1206-1214) which, at the time of their expulsion by the Saracens in 1247, was adapted to new circumstances by pope Innocent IV. In consequence, the mystical space of Carmel with its contemplative life is experienced wherever they are given a place and God calls them. The commentary presents the Carmel as a spiritual model which is ideally suited as accompaniment on the spiritual journey of all who know themselves called to a life in God’s presence in the desert of their life. The book she based a lot of her talks on was actually written by one of the priests in her community. Thank you Sr Hettie for helping us understand and appreciate more the gift of this rule and especially the importance of silence as a means to love our union with God. 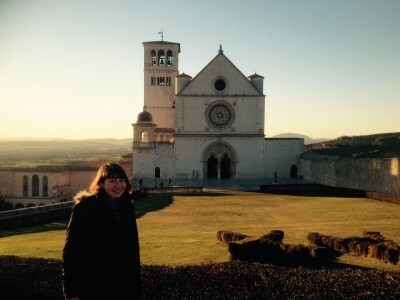 Our return from the conference in Rome took us via Assisi where we stayed with a friend whose generosity made the visit possible. The graces received in praying at the sites related to St Francis, St Clare and Carlo Acutisl, whose cause for beatification has already started was palpable to say the least. Carlo was born in London in 1991 and died after a sudden and short illness in Milan in 2006. This teenager is a model for all young people and is certainly interceding for England. Please visit this site http://www.carloacutis.com/en/association and be inspired by this holy teenager. Sr Camilla and Carina were able to attend the concluding conference in Rome for the Year of Consecrated Life from the 28th Jan until the 2nd Jan 2016. On the theme “Consecrated life in communion. The common foundation in the variety of forms”, on these days there were meetings, prayer vigils, times for regrouping and examining in greater depth the specifics of each form, looking prophetically towards the future”. The aims of the meeting were to get to know better the great mosaic of consecrated life, to live communion rediscovering the single call uniting the variety of forms (Ordo Virginum, monastic life, apostolic institutes, secular institutes, new institutes and new forms of consecrated life), starting out together on the path of the great Jubilee of Mercy that once more gives all consecrated people the specific mandate of their vocation: to be guided by the Father’s mercy, witnesses and builders of an authentically lived fraternity. Four of us managed to go to Rome for the recent World Meeting of Young Consecrated men and women. Organised by the Vatican dicastery as one of the events for the Year of Consecrated life, t turned out to be an amazingly fruitful and graced time at so many levels. 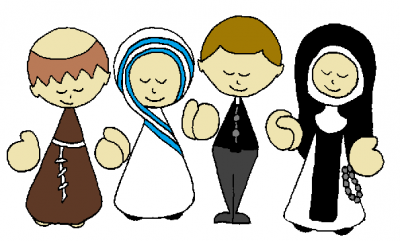 Join us in praying for an increase in vocations to the religious life and consecrated life in its many forms and for past, present and future members of COLW. We were so happy when Pope Francis last year appointed Father Alan Williams SM, the last Director of the National Shrine of Our Lady at Walsingham, as the seventh Bishop of Brentwood. Now we have two dioceses, that of Brentwood and that of East Anglia, headed by men who have a deep love for Our Lady of Walsingham. That couldn’t be better news for our little community. Mary is really moving things in England, her dowry. It also confirms our hunch that God is truly at work on the bigger picture (COLW being only a small part of this) and slowly but surely we will get more glimpses of the many graces he has destined for our land and beyond. His episcopal ordination took place at Brentwood Cathedral on 1st July 2014 at 12 noon. You will find some highlights on this page. 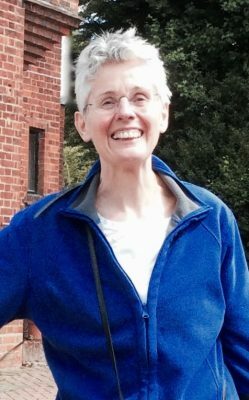 Take a listen to a recent interview that Sr Theresa and Jim (our first brother to be) recently had in Chicago on the Winds of Change Radio Show. Download the article in PDF format by clicking here. We are currently celebrating the Year of Consecrated Life, which began on 30th November 2014 and will end on the 2nd February 2016. The theme given it by the Vatican is ‘Wake up the World’. As a community we will be offering some events before and during this year in order in order to highlight this three-pronged focus. A piece on Abbotswick in The Tablet, 23 November 2013. We recently went with several discerners to a Year of Faith pilgrimage to Rome for novices, seminarians and those on a vocational journey. Pope Francis joined the 6000 people on this pilgrimage for a meeting in the Pope Paul VI audience hall. Before his arrival we were entertained by musicians (including The Priests) and heard several testimonies (including that of Fr Robert Barron). Go to the 1 hr 9 mins point of the video to see him arriving in the hall. Look out for Sr Theresa who managed to shake his hand! Download the full text of Pope Francis’s address (translated into English) and read what he shared with the everyone during this meeting). It’s hard not to be in awe of the dedication of modern-day nuns, whether or not you have faith. Unflinching in their quest to tackle difficult issues head on, a nun’s life is anything but sheltered. And, it seems, more young women are looking to devote their life to God. Of those choosing to become nuns, the number of women under 40 has risen from 42 per cent in 2006 to 70 per cent in 2010, according to the National Office for Vocation. Listen to Sr Camilla’s thoughts for the Sundays of Lent on BBC Radio Essex, each Sunday morning at around 6.50am and again at around 8.50am during the Sunday morning show hosted by Peter Holmes. 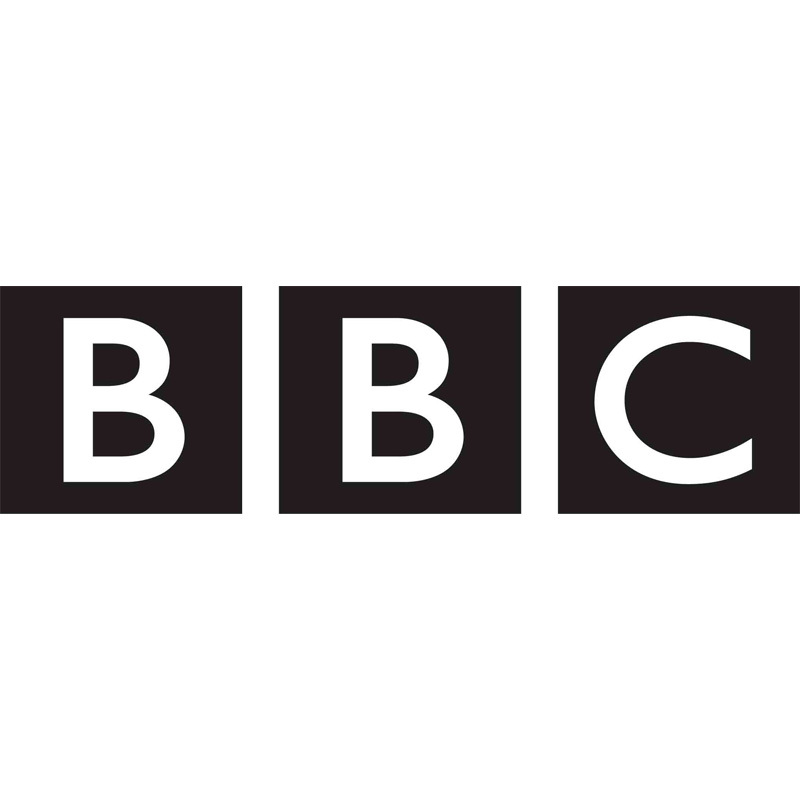 Alternatively listen to them here where they will be uploaded each week once they have been broadcast. 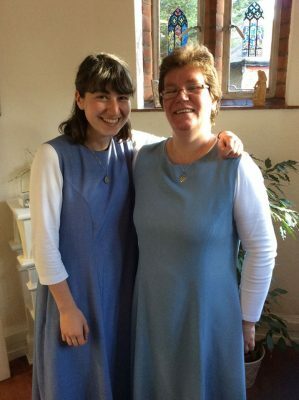 In Essex, the youngest religious order in the UK is welcoming new sisters… and its first man. Please Note: This interview was conducted before our first brother joined the community. If the link is inactive, you can download the article in PDF format by clicking here. From oil-field workers to city traders, there has been a blaze of publicity in Britain about the need to bring more women into male-dominated careers. But far less media attention has been devoted to the fact that one of the few all-female callings is under threat. 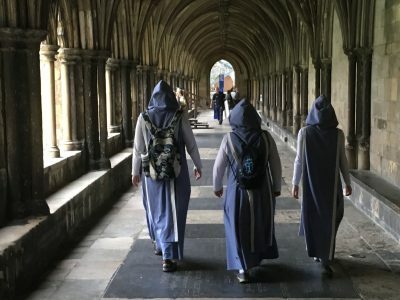 While more and more women are becoming nuns worldwide, the number of novices has fallen in Britain. 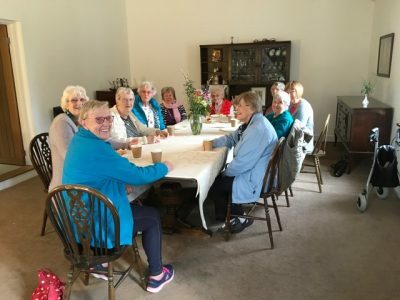 The new religious Community of Our Lady of Walsingham is the order that likes to say ‘yes’ – obedience, silent prayer,poverty and the rosary are in, but so are chilling out and trips to the movies. A distinctive departure from other orders, its statutes are designed to use the gifts of women more fully. You can download the article in PDF format by clicking here. 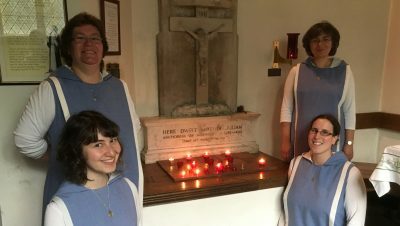 Migrant worshippers are helping to swell Catholic congregations – and yet the ageing population of British nuns is teetering on the verge of extinction. 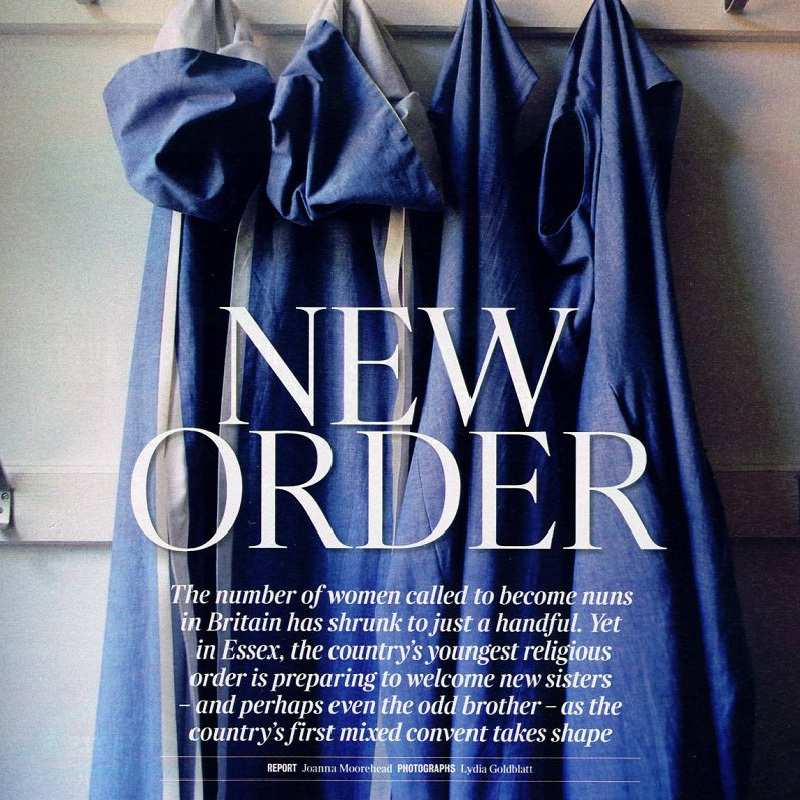 Is there any hope for the religious sisterhood, asks Joanna Moorhead.